It’s all in the name at The Peacock Indian-Inspired Tapas in Observatory’s Lower Main Road. Owners Andrew Williams and Priya Reddy saw a gap in the quirky Obs food scene, put it together with the globally trending Indian tapas format and developed something uniquely their own. 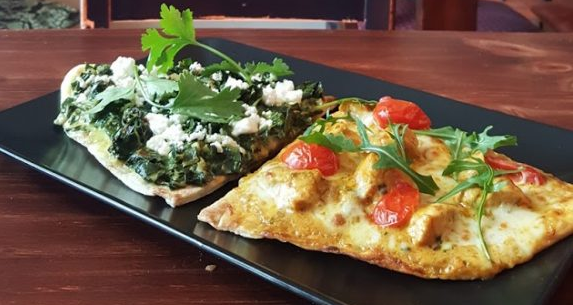 So while their butter chicken, saag and lamb curries have traditional Durban and South Indian influences in spicing and flavour, they might come served on naan bread pizza-style or dolloped into a mini puri. The new Breyani chicken bombs are reminiscent of Italian arancini in form, but pure Indian in flavour dipped into a fresh mint raita as a casual tapas snack. Working with Priya to push the creative boundaries of Indian cuisine is chef Wadia Dramat, inspired by the magic of watching Indian, Indonesian and Malaysian chefs, growing up in her family’s restaurant, East and West. “I’ve tried to come up with something that is real Indian in flavour, aroma and experience, but that would please all palates,” she explains. The vibrant and welcoming space hosted by Andrew and manager Carlo Adams has quickly drawn a regular local clientele and word is spreading. Wadia balances the spicing of dishes at mild and fragrant entry level but is happy to personalise added degrees of heat for those who want more punch. The delicate approach allows for plenty of flavour experimentation. We were wowed by the mashed potato, thyme and truffle oil samosa, one of a quartet of inventive fillings, including a lively chickpea with ginger and lime. Save room for the trio of desserts, a gorgeous kulfi ice cream infused with saffron, wickedly rich 72% chocolate pot with a whisper of chilli, and substantial coconut and cardamom truffles, playing the creative spice card to very last spoonful.